Moose Family & Friends Page 1! 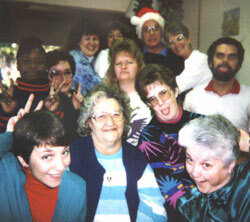 Here's page one of the people who make our lives a little happier everyday. Russ is a Program Manager for the Parks Division and Jennifer teaches at Thomas Jefferson HS. AKA Slurpee Girl, former boss and party queen. 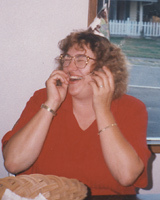 Shelley worked as the Parks Volunteer Coordinator and was hired the same day as Robert in 1990. If you see her, ask her how she first met him. Trooper Creative Consultant and Robert's Office Security Blanket for many years. She nows works for the City of Woodinville.She doesn't call, stop by or say hi nearly often enough. Sniff! 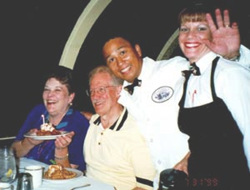 Jan first hired Robert as a gym supervisor nearly 20 years ago. 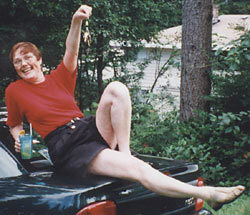 She's now retired from the parks department, after 30 years as a Recreation Coordinator. 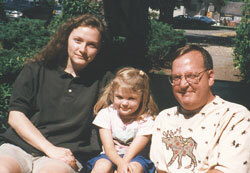 Robert actually knew her when her hair was brown. 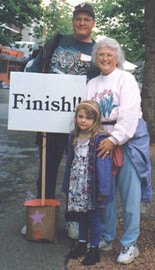 This picture is from the Great Strides finish line in 1998. 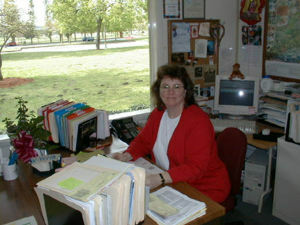 Lynn is an Office Tech in the Marymoor Park office. She does all the work that makes everybody look good! Former budget guru for the Parks Department, with her husband Moe. 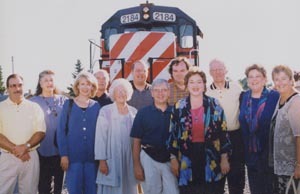 Penny retired after 30 years with the department, and one of the gifts we got her was this trip on the Washington Dinner Train, July 1999. 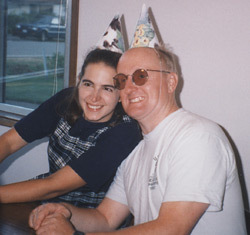 This Christmas card photo is from either 1988 or 1989. It's the parks staff from the Federal Way recreation office, Robert's previous stop before Redmond. First row (l-r): Donna Oster-Dahl, Barb Garman, Sharon Roberts, Jan Contento. Second row: Tina McKenzie, Tedi Surles, Carrie Hamby, Wayne Alishokis. Third row: Gail Thompson, Juanita Wallen, Robert, and Glennis Golden. Friends Now in Concentrated Form! This is the group that went on the train trip. Front row: Linda Flajole, Jan Contento, Greg Van Horn, Maria Van Horn. Back row: Bob Cooper, Linda Dougherty, Rich Flajole, Robert, Jay Osborne, Mo Wade, Penny Wade, Sharon Cooper.